Whenever I go ape-shiza over a car here in Japan my Japanese friends always look at me funny. They can't grasp why something as common as a Skyline or an RX-7 would possibly cause me such excitement. I personally thought they were just taking for granted the amazing cars they have here, but after a recent trip to the magazine stand, I came to a realization that has changed my outlook on the whole thing. I had heard previously that many Japanese were very fond of american sports cars. I had always figured they were few and far between and only liked it cause they rarely saw it on a daily basis. I had no idea that there was a whole subculture obsessed with american cars here in Japan. A large enough subculture that there is an entire magazine devoted to them. 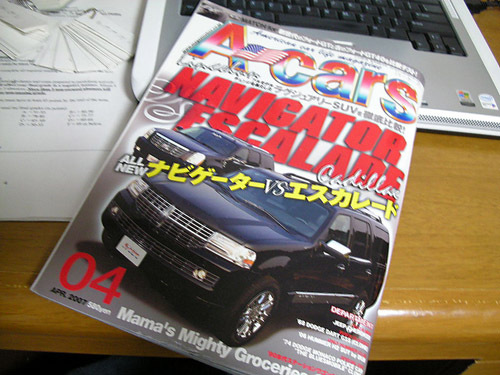 Enter A-Cars magazine. Your monthly source for all things automotive and American. This healthy sized tome sports some 300 pages of yankee styled car knowledge. After a literal 'LOL' in the 7/11 I shelled out 580yen for this bible de americana and took it with me on the train to learn of Japan's outlook on our native car culture. 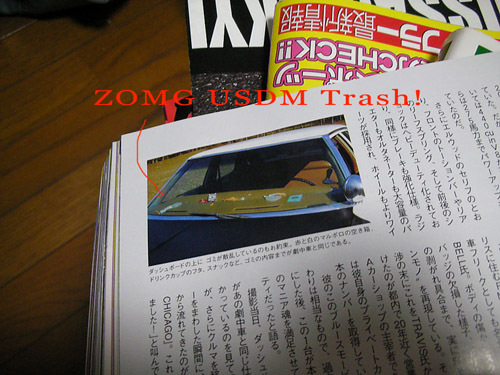 I was surprise...no...disgusted, to find the kind of cars they showcased in this magazine. Cars you'd pay to have taken off your property were presented with an assumed value on these glossy pages. Let's take for example the car pictured below. Done stifling that vomit trying to escape your stomach? Cars like this riddled the pages discussing not only the car specific features, but the style in which the owner kept it. Things you'd cover your nose upon seeing were displayed as a prized style of upkeep. Also, note the 'Special One' on the side of the page. 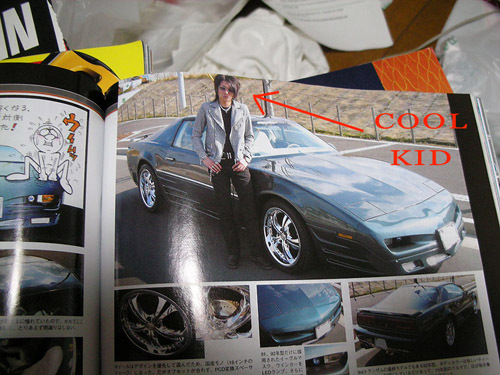 I'm convinced that when the editors asked the local americans about the owner and his car, they received a response along the lines of, "Oh he's special" and misunderstood the true meaning behind the comment. This picture is an awesome example of this. The comment below the picture is talking about the type of trash found in the rear dash of this old rust bucket. Describing as if it is the cool american thing to do. Listing the Marlboro cigarette box, soda encrusted cup, potato chip crumbs, and misc. papers as if that was the way you too should litter your car. It gets worse then just revering our trash in monthly periodicals, they pay out the nose for it. I understand the text is small but I'm sure you recognize the cars. Those are the cars littering and polluting our streets and highways throughout America which cause our eyes pain when seeing them. 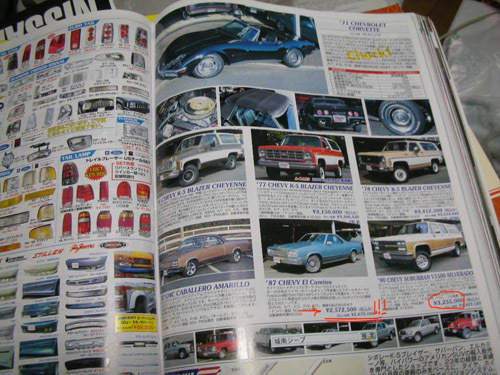 Throughout the book many dealerships specializing in the importation of American cars advertise their best deals here. 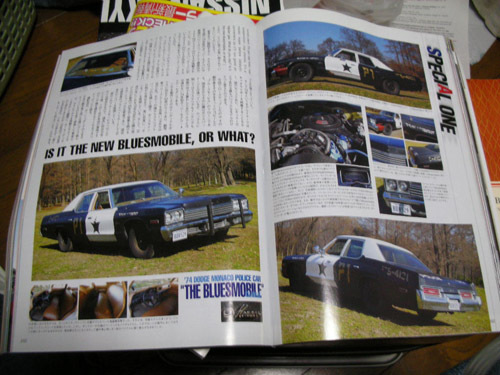 This specific dealer is selling that blue 87' El Camino I underlined for $23,218(2,670,160yen). 23 grand!? I'd pay to have that ugly heap removed from my driveway! How about a 78' Chevy K-5 Blazer for a whopping 30 grand? Yea that's the price. The list goes on...unfortunately. Stop for a minute and think about it though. Cars which are so incredibly common here in Japan fetch quite a hefty price in the states. Take for example my R32 Skyline. Said and done I paid about $14,000 for my skyline for a gts-t model. That exact same car would get me, if I was lucky, $2000 here. Another example, think about the FD3S Mazda RX-7. Kelly blue book for a 93' model in the US is around $13k. Here? around 3k-5k for a low mileage 93'-95'. It goes to show the simplist model of economic supply and demand. As a human nature, we want what we can't have, what's rare. Whether it be for status or interest in the foreign, it holds true for everyone in every country. Haha, you can't help but laugh though. Cars like this you'd expect your grandma to pick up groceries in. Own a Taurus? Feel bad about it? Find some comfort in the fact that while you look lame in the US, some Japanese people think your car is bitchin'. Oh Dang! That's an awesome cool firebird with sweet chrome rims huh? hahaha. My guess is he has the same things going through his mind in this picture that we do when we proudly pose in front of our 'JDM' rides. He gains praise for achieving an authentic American style car the same way we ordain levels of 'JDMness' to our Japanese sports cars in America. If you have a love for Japanese sports cars, you then have to ask yourself if that love is only because it's rare or if it's rooted from a true appreciation for that style. This problem far from keeps me up at night though as the sound of a turbo car or an RB-series motor brings a smile to my face everytime. Are you hopping a bandwagon or do you really like it? Do you even care? It all comes down to personal preference. I know hundreds of friends who love the sound of a modified american V8, and hey, more power to them. I myself can't get enough of turbo 6-cylinders or cleanly modified import aero kits. When you pick up your Super Street or Import Tuner do you get giddy when they tour such famous makers as HKS and Apex'i? Well it's a two-way door for the Japanese american car enthusiasts. 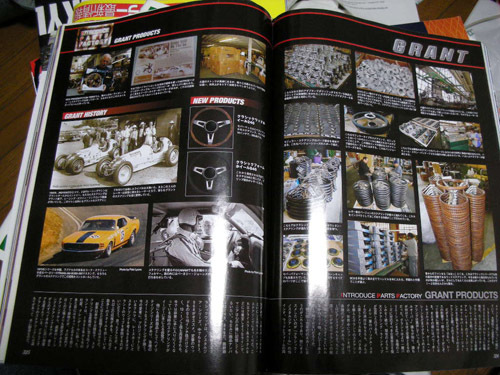 This issue they toured the Grant steering wheel factory in the states. You can buy Grant steering wheels in your local Kragen if I'm not mistaken. I couldn't help but chuckle at such an article. They even have an oldschool american car article section. In these articles there are picures of elderly americans grinning for the camera. 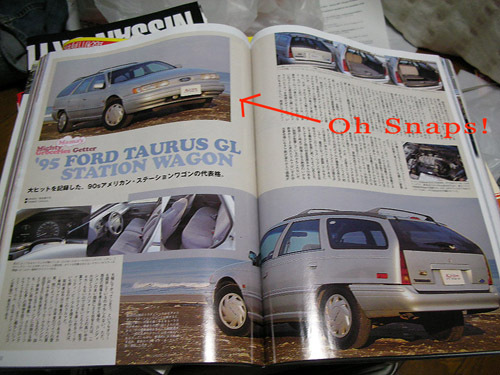 I couldn't help but wonder how this magazine's editors and photographers approached the owners of these cars. It's pretty much the exact same as America, just flipped. 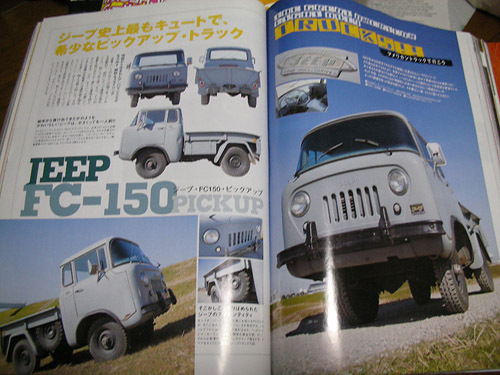 We have a large body of people who love domestic cars, and a slightly smaller body of people who like Japanese cars. And in Japan, they have a large body who loved their domestic cars (Toyota, Nissan, Mazda, etc. ), and a smaller group that loves American cars. What did I learn from this? Don't judge people's opinions of cars too quickly. While I might find american car style damaging to my psyche, others may like it. I also found yet another things the Japanese are mirror to us in. It's still pretty funny though. Paying money for El Caminos..haha. > You know I still kinda find it funny that they even picked up some of our bad ideosyncracies when it comes to cars. 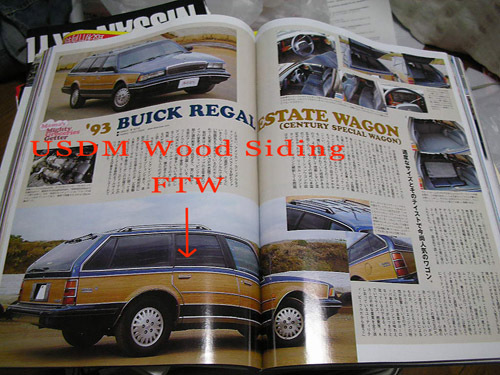 Dont hate i was thinking about getting some USDM wood siding FTW imported for my skyline plans. > They're obsessed with our cars, we're obsessed with theirs. Makes plenty of sense to me.